For the Xfinity Series race held in 2011 and 2012 at Dover International Speedway with the same name, see Drive Sober 200. 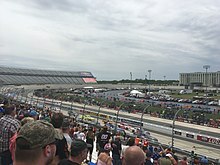 The Allied Steel Bulidings 200 is a NASCAR Xfinity Series stock car race that takes place during May at Dover International Speedway. Held the day before the Monster Energy NASCAR Cup Series AAA 400 Drive for Autism, the race was broadcast in the United States on ESPN until 2015, when the race moved to Fox Sports networks. In 2016, the race was moved to the second week of May because of the Monster Energy NASCAR All-Star Race, and was 200 laps in total with two 40 lap heats and 120 lap main as part of the Xfinity 'Dash 4 Cash' program. In 2017 the race would not use the heat races and would utilize NASCAR's new stage format with stages 1 and 2 being 60 laps each, with stage 3 being the final 80 laps. 2010 and 2011: Race extended due to a green–white–checker finish; 2011 took two attempts. 2016: The main event was reduced to 120 laps, while 80 other laps were divided into two heat races for the Xfinity 'Dash 4 Cash' program. This page was last edited on 19 April 2019, at 18:51 (UTC).